Come experience an all-out presentation of Steve's soundworlds, live in Tucson Arizona. Steve will be joined by guest percussionist Byron Metcalf. Computer animations and light artistry by Richard Baily, Lynn Augstein, Steven Rooke, and Floating Worlds. Multimedia surround-sound production by Roger King. Steve's full-scale concerts in his hometown of Tucson have occurred about every four years since 1990. Each time it's an event not to be missed, as the notion of "there's no place like home" is especially meaningful when it comes to pulling out all the stops not far from his Tucson-based studio. Spirits are high at these events with the production support of his circle of friends, along with the overall desert atmosphere that permeates Tucson and Steve's music. Tucson's March weather is mild, so travelers needn't fear the desert's extreme heat. The concerts always attract a great collection of fans from far and near, adding to the excitement. Like the previous Tucson concerts, a reception will be held after the concert. This year's concert comes right after Steve's half-century birthday, adding another good reason to pack your bags and infuse the desert atmospheric conditions. This time Steve is producing the entire event, and he's chosen a venue that could prove to be the most conducive space yet for experiencing the immersive nature of his dynamic sound journeys. You'll have room to relax, move about and stretch out as you're invited to set up your own Comfort Zone. The aim is to be free of the confinements of conventional seating and the restrictive demands this puts on the listener. Everyone is encouraged to bring cushions, blankets, sleeping bags, pillows, low-profile beach/lawn/camping chairs, futons or other modes of personal comfort. We'll create a living-room like environment in this great-sounding performance space. At least the first half of the space will be open for the Comfort Zone. Chairs will be set-up beyond the Comfort Zone. The soundworld journey will feature a moving blend of visuals, many of which were experienced at the recent Palm Springs concert. This event will also premiere the stunning animated dreamworlds of Richard Baily, a master of computer-generated light and organic form. His work has been featured in major motion pictures; most recently he created the surreal planet environments for the Steven Soderberg film "Solaris". The images featured during the evening will be from the new DVD collaboration between Steve and Richard, which hopefully will be available by the concert date. While the program will always be in flux, even days before the event, expect to experience the full spectrum of Steve's work. Joining Steve will be frequent collaborator Byron Metcalf on percussion, helping drive the trance passages to the brink. Possible additional guests to be announced. Get ready for approximately three hours in the deep end of the soundcurrent. Discount room rates are available at the Hotel Santa Rita (formerly the Clarion) at 88 Broadway. 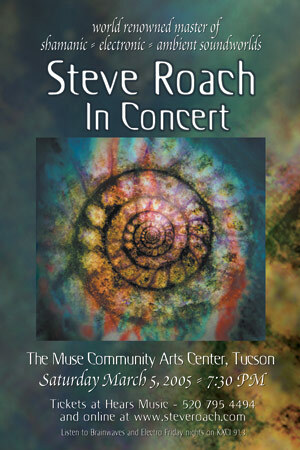 Call 520-622-4000 (or e-mail tomlewisclarion@aol.com) and ask for the "Steve Roach Concert" rate: $89 for a $129 room. The hotel is located in downtown Tucson, about an 8-minute drive to the concert venue. Connected to the hotel is a great restaurant, Café Poco Cosa featuring Sonoran food  highly recommended! For late-night after concert feeding and breakfast, The Grill is open 24 hours and is one block east of the hotel on Congress. The hotel doesn't have a web site, but Google will take you to listings, info and maps. 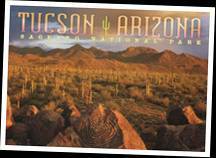 For those who want to go the route of camping out  either tent, car or RV here's a great campground in the middle of the Saguaros, about 20 minutes from the concert venue: Gilbert Ray Campground in Tucson Mountain Park. For those arriving Saturday afternoon, you might want to check out the wealth of restaurants and coffee shops right around the corner on 4th Avenue. Here you'll find all that need, just steps away from the venue. Here is one nice example: "Delectables".